Also set in World War I, this book is written from a different perspective than the book Mary Jo wrote about two weeks ago. The story opens in England on a hopeful note with Kezia Marchant preparing for her wedding to Tom Brissenden just weeks before war is declared. It is a poignant story of love, friendships, changing relationships, differing philosophies, duty, sacrifice, and bravery. The lies of the title include those in the letters Tom writes from the trenches to limit Kezia’s concerns, and Kezia’s unique stories in return of the delicious meals she dreams up to serve him instead of worrying him about changes on their farm. Other characters lie to themselves or live lies to justify their actions and beliefs. This story provides a very human look at how the stresses of war can affect individuals, families, friends, communities and cultures. 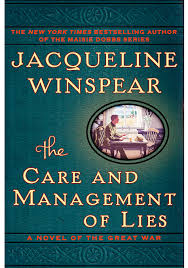 This is a standalone book, but Jacqueline Winspear also writes the Maisie Dobbs series set in England after World War I.